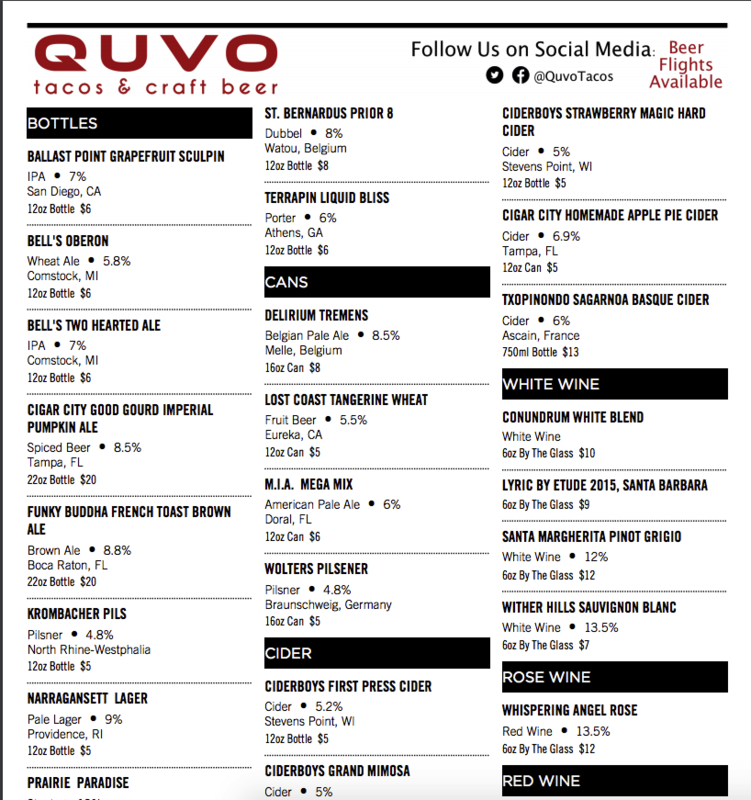 BeerMenus offers several print menu layouts and designs that automatically organize your beer menu by serving type and beer style and automatically fill in the beer description, ABV, and beer style for each beer you have. Below are details about all of the customizations available with examples of each design. 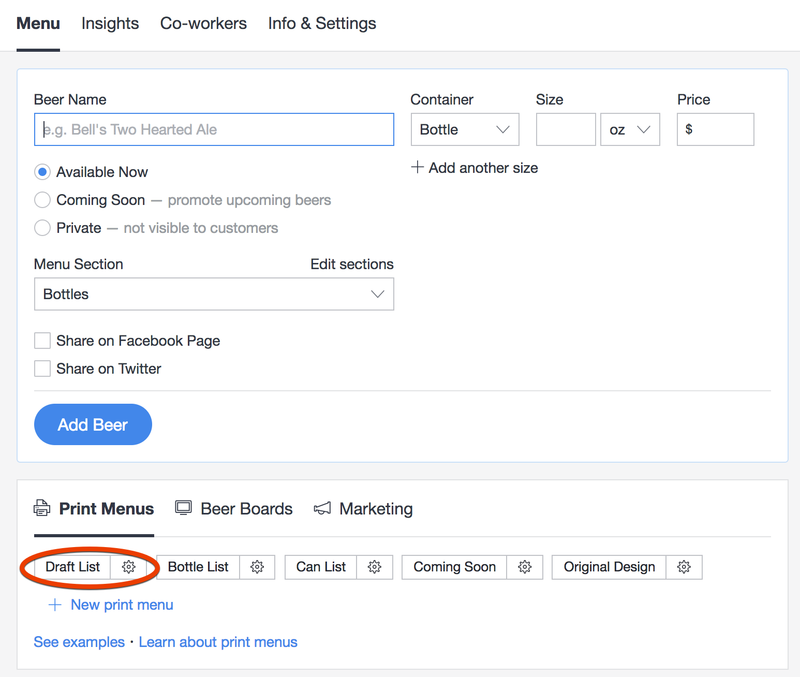 If you haven't already, add your business to BeerMenus and add the beers you currently have. 1. Once logged in, go to My Businesses (at the top right of the screen), click 'Update Menu." 2. From your Update Menu page you will find your Print Menu Profiles (above). You can create as many profiles as you wish to suit your needs. For instance, you could create a menu that features all of your wines and cocktails and have another that features just your tap list. 3. Each specific profile features a "Gear" icon to the right of the name. Clicking this "Gear" icon sends you directly to the back-end settings for that specific menu profile. From the back-end settings you can make changes to the layout and style of your menu. 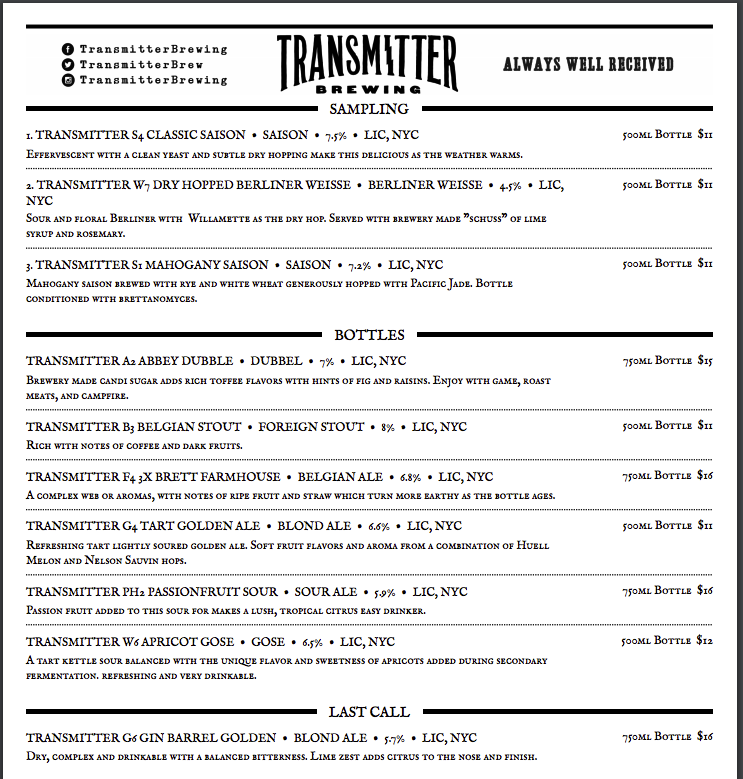 Logo/Header Graphic: BeerMenus print menus allow for a full customization of the header section. From here you can upload your own custom image (Height = 200 pixel, width = 2288 pixels), with your own logo, social media handles, address, or any other information you want! Not graphically inclined? No problem! Our team will work directly with you to make one that matches the look and feel that you want. 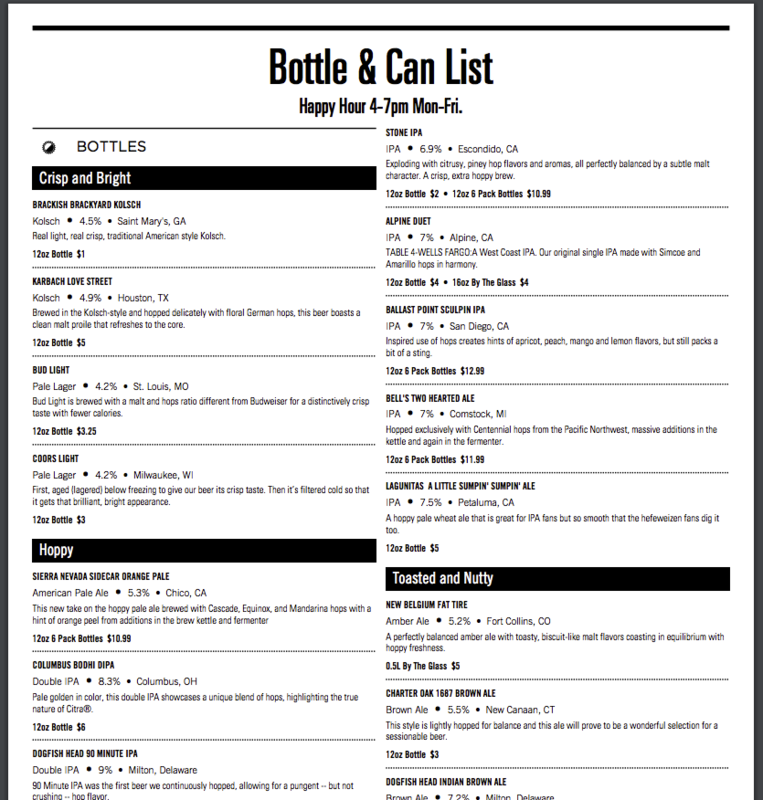 If you would like a print menu consultation or custom banner you can reach out directly to Support@beermenus.com. You can also browse different print menu examples at the end of this article. Paper Size: You have the option here of printing on standard letter sized paper (8.5 x 11 inches), or legal sized paper (8.5 x 14 inches). You have the option here of sorting your beers alphabetically by the name of the beer or sorting by the style of the beer. 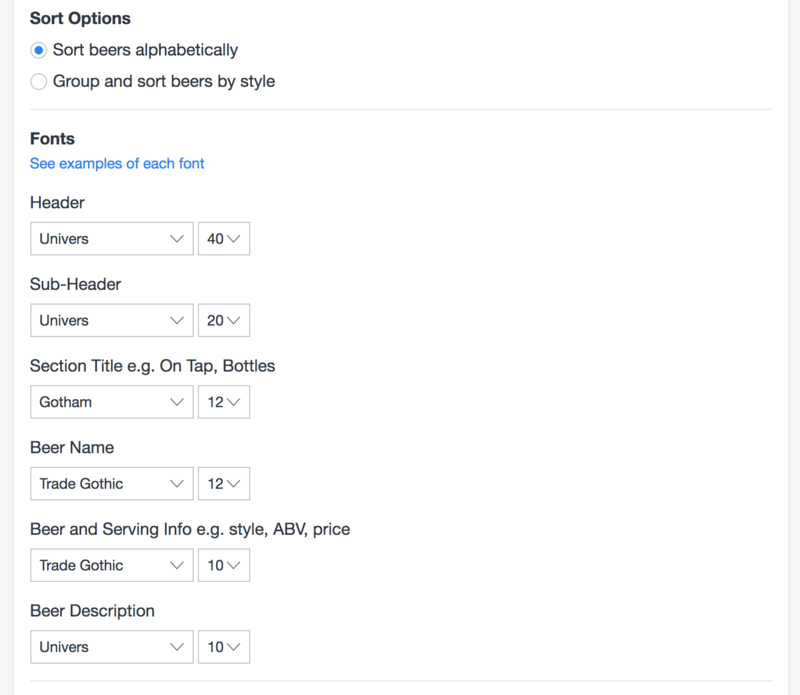 Sorting by style will break the beers into categories based on their style. For instance, a Double IPA would fall under the category "Hoppy," a Pilsner would map to "Crisp and Bright" an Imperial Stout would be classified as "Strong and Boozy." This is a great tool to have on your menu as it shows customers exactly what they are getting into before they buy the beer. With all the crazy beer name sorting by style can help get to the core of what the customer is looking for. You can switch between the 35 fonts we have for each different section and section header on the menu. You can also change the font size of each section to help draw attention or to get that menu to fit onto as many pages as you like. At the top you can view a "Preview" sheet to see what each font looks like. 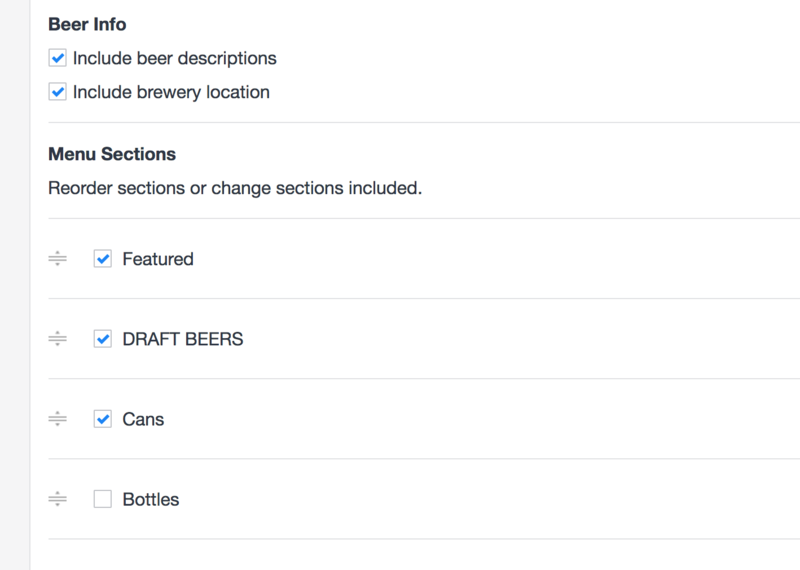 Include Beer Descriptions: This feature allows you to toggle the automatic beer descriptions on and off. This can be a useful feature if you are looking to make a "cheat sheet" for your staff or if you have a massive selection and are looking to cut down on paper use. Menu sections: Here you can drag and drop your menu sections to be in the order that you want them on your menu. The settings show all of your menu and custom menu sections so that you can check the box to include or not include them on your menu. Let's say you wanted to create a "Bottles" only menu. You would check only the bottles category for this profile so that it only pulls that portion of your menu. At the very bottom of the setting page you will see this "Update" button. 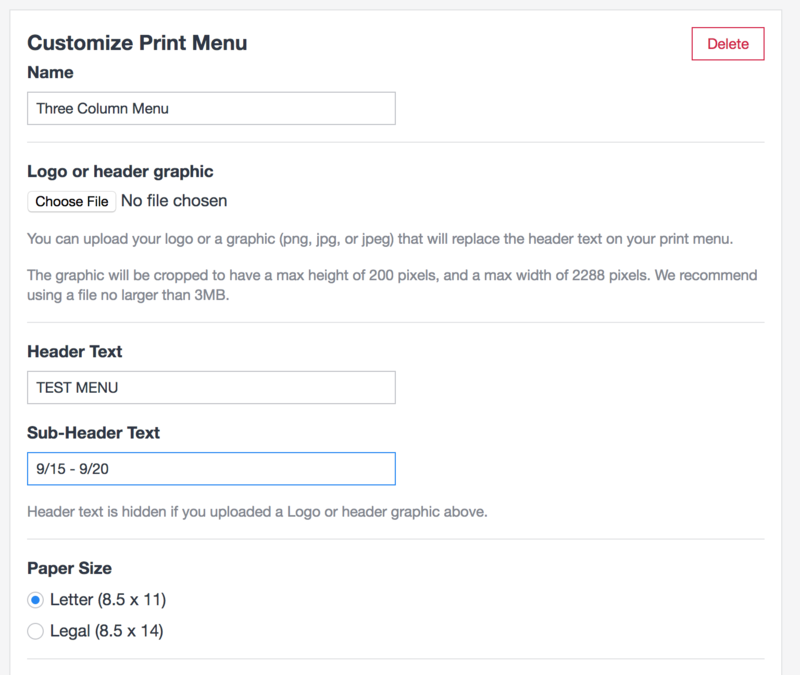 Click this and it will save your settings and create your brand new print menu! Last step: Push the button to the left of the "Gear" icon with your print profile name. This will automatically generate a menu with all your beers and settings that will be all set to print! You can add a custom banner to your print menu to include any info you like. Email support@beermenus.com for help setting up a custom banner for your business. Learn more.